It turns out that, when I was writing about vaporwave music a couple of weeks ago, I actually wanted to talk about shopping malls, so I shall. It has been a torrid time for retail businesses in both the UK and the US, as familiar brands bind us together. I have walked past the Toys R Us store from where thirty years of our family’s toys have come, but I did not have the courage to enter, let alone face the staff that are losing their jobs. My ears were pierced in Claire’s Accessories, and while it has entered into chapter 11 bankruptcy in the US, the UK side may yet file for administration, joining the electronics shop Maplin. Carpetright, fashion chains New Look and Select, and restaurants Jamie’s Italian and Prezzo, have all entered into Company Voluntary Agreements, closing branches to make themselves solvent again, with Prezzo closing its Chimichanga tex-mex chain, one of my favourite restaurants, in its entirety. Then, there are businesses that are doing relatively fine, but still have to adapt – my mother has just helped close the high street department store she worked in for the last eleven-plus years, with its replacement, a food-only store, being based out of town. Clearly, location is everything, and where we shop is more likely to have an address ending .com, or .co.uk, rather than PO1 1EA. The spaces left behind by this shift have, unexpectedly, become a place for contemplation, as I found out one day. I have no idea what I viewed on YouTube for “Dead Mall Series,” by American filmmaker Dan Bell, to be recommended to me, but I was transfixed from the first video. Each set-up is similar – a first-person walk around a shopping mall, often built in the 1970s or 80s to redevelop former industrial areas. You see the postmodernist appropriation of natural surroundings – marble courtyards, skylights, palm trees and fountains, all garnish for the air-conditioned racecourse of shop fronts, still identifiable long after the business, and customers, left. 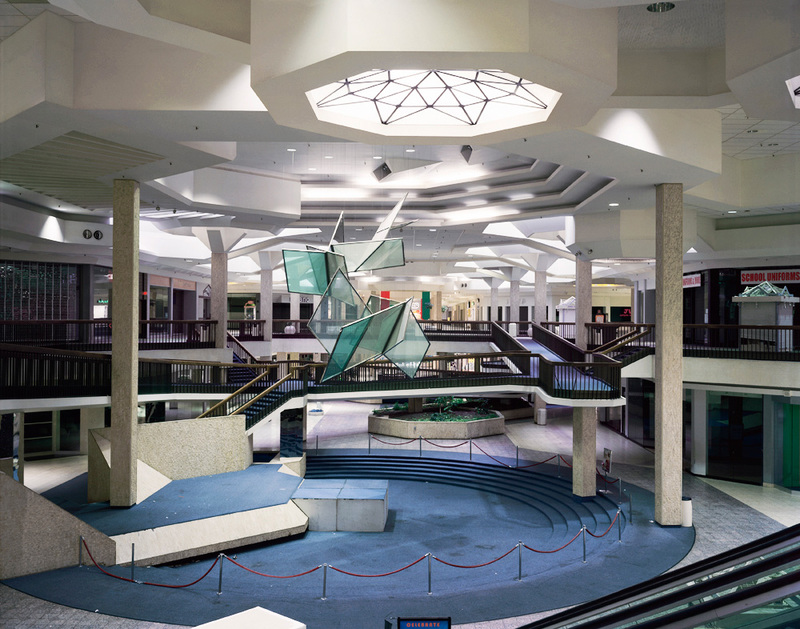 The effect is alienating and bizarre - some malls once housed over a hundred stores, and are now down to its last few, variously down to larger “anchor” stores leaving, competition from other malls, the rise of online shopping, and crime and neglect, as mortgages and taxes on the mall are unable to be paid. 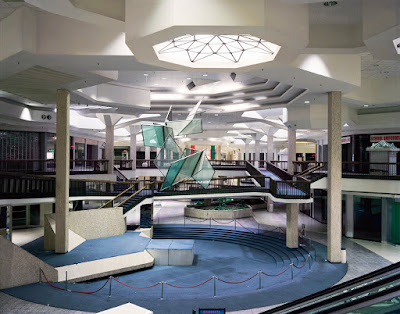 You see where the malls have changed for the worse – plants removed, fountains turned off, whitewash on the walls, or even fake walls put up to repurpose shops as offices, gyms, or even just to make spaces that may never be filled again. The most extreme example of a “dead mall” known to most people was the Dixie Square Mall, based in Harvey, Illinois, which closed in 1978 after just twelve years, in time for it to be used in a chase scene for the film “The Blues Brothers” (1980). However, it took until 2012 to be demolished, during which time around ten proposals to reuse the space came and went, before crime and vandalism turned it into a derelict ruin. As of 2018, the land is a brownfield site, still waiting to be reused. In “Dead Mall Series,” and other YouTube-based series like “Ace’s Adventures,” and “Retail Archaeology,” the use of vaporwave music heightened the nostalgia for a mode of living that was dying out, as if this whole capitalism thing wasn’t working out. Going to the mall was once something you could do all day, as restaurants and cinemas often formed part of the same complex. The mall security ensured you had a safe space to hang out, but once fortunes change, there is less reason to keep you there, and less reason for mall owners to keep trying. 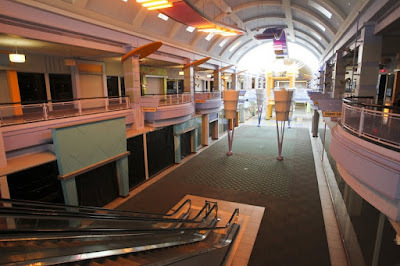 This is why you see many videos about the same malls appearing, such as for the Forest Fair Village in Cincinnati, Ohio, and Century III Mall in West Mifflin, Pennsylvania – these are cavernous spaces that are almost abandoned, but can be freely explored, because they remain open, even if the plants have died, the roof leaks, and the lights are going out. For me, these grand spaces are fascinating. 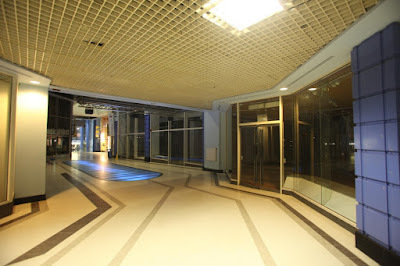 The postmodern architecture and aesthetics of shopping malls and vaporwave feed off each other, that area of thought and practice is now coloured turquoise, salmon pink and grey for me, matching the floor tiles and fixtures of many American malls. The stillness of walking through a place that is meant to be buzzing recreates that lost energy in yourself – you wonder what had been made of this space, and what could still be done, but the sadness moves from feeling the lost prestige of times past, to the acknowledgement that buildings that lose all purpose will inevitably be demolished. Malls in the UK are often smaller, and built around the back of existing high streets, so the experience of walking off a busy street into a scene of desolation is very jarring indeed. Last year, I made a video about The Bridge Shopping Centre, a small mall built in Portsmouth in 1989, which backs onto a supermarket. Last year, I made my own video, walking through what had now become a corridor to the supermarket. Since then, two more shops have closed, a pet shop and jewellery store, with barriers preventing you from walking past the pet shop - there is little incentive for anyone to consider opening a store there. A time capsule was buried when the mall opened in 1989, and it may not be too long before it gets dug up. I am not sure what lessons I am supposed to take from dead shopping malls, except to treat their insides like a desolate art gallery while they still remain. Our lives no longer see malls as leisure in the way we once did - creating your own nostalgic entertainment through them may be their last possible use. Vaporwave quotes the alienating, desolate feeling of a dead shopping mall as much as the malls themselves tried to take cues the outside world, creating a safe, enclosed space. Maybe I am nostalgic for something that was never really there, but wanted to be there, thinking it would always be there. Maybe that is the power of retail, and why I couldn’t step into Toys R Us one last time.